The chlorophyll specific absorption coefficient (\(\bar k\) c) was measured for zooxanthellae from six hermatypic coral species obtained, where possible, from four depths (1, 10, 30, 50 m) on reef sites near Discovery Bay, Jamaica in February and March 1983. Measurements of photosynthetic rates versus irradiance, as well as cellular and areal chlorophyll a, were also performed on these colonies or sister colonies. Together the data were used to compare minimum quantum requirements (1/Φ m) among species and depths and to assess the importance of light utilization to the growth and depth distribution of these corals. Our data suggest that, although \(\bar k\) c was found to decrease with depth, interspecific differences in \(\bar k\) c do not occur for zooxanthellae from the corals investigated. Minimum quantum requirements (1/Φ m) decreased significantly with depth, thereby reflecting an increase in photosynthetic light utilization efficiency with decreasing irradiance. Interspecific differences in 1/Φ m determinations were suggested but not statistically conclusive. 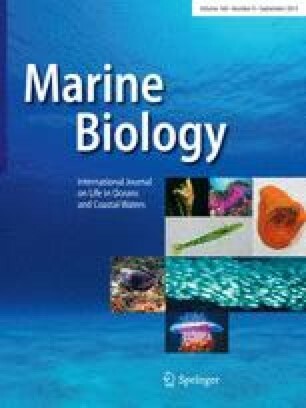 We conclude that interspecific differences in gross photosynthesis, and perhaps growth and depth distribution, are primarily attributable to differences in the light utilization capacity of the whole coral, as reflected by the product of \(\bar k\) c ′ and chlorophyll per unit surface area, and in-situ quantum efficiencies.